Name Brand - Sony-Cannon-Olympus, etc. Minimum of a 5 megapixal image size. Want a at least a 4x zoom feature. Need to be able to take reasonable close up(s) of stuff like flowers or small critters. Although I might play with it in caves when we have slaves around, this is expected to be used as an everday camera for hiking, kayaking, camping, Christmas, etc. Please defend your pick. Thanks in advance! $168.95 Canon Powershot A540, 6 megapixel, 4x Zoom. BUT it's bulky, takes 2 AA batteries and it probably smells like fish. If I can get you to spend about $50 more than you maximum budget, for $294.95, I'd highly recommend the Canon Powershot SD700. - probably doens't smell like fish. As with any digital camera purchase, I'd recommend purchasing an extra battery and higher memory card. Cameras come standard with some (probably fishy smelling) little, teeny, tiny, yay-big memory card that you can take a few pictures with. B&H offers 'basic kits' and 'deluxe kits' that has stuff like an extra battery, camera case and (usually) a nice 2 gig memory card (Sandisk)... you pay an extra $50 - $100 for that though, still not bad. CaverScott wrote: Name Brand - Sony-Cannon-Olympus, etc. Your cam is the Canon SD700! Fulfils every requirement save price - might can find for under 2-fiddy on Ebay or web. Awesome picture quality. Or, the SD600 and SD630 are practically the same, but 3X Zoom and lower price. 7 megapixel, waterproof to 5 feet (enough to take on the water or into caves without fear), can be had for about $230 online. Ok, I may be modifying my budget. Keep the information coming. Decisions, decisions! I have owned the Canon SD 500 for a couple of years now, I had have nothing but praise. It is a tough little camera, because I have abused it. My only complaint is the touchy focusing that some canon's are known for, but that may have been corrected in the newer models. I have a 540 and it takes pretty decent pictures, but is not very cave/humidity friendly. The first cave trip I took it on, the automatic lens cover started jambing and does not open fully without a slight tap. I have also been less than impressed with it's macro capabilities. Nice optics and good color though. Yucca - how are you enjoying that W20? I looked into getting one not too long ago, but wasn't sure how well it performed. Also, I am not sure that I like the slim design of the new P&S's. I don't know about the 500 series, my girlfriend has the A510 and it takes FOREVER for the picture the process (almost 7 sec if you use the flash). I have a Sony DSC-S60, and the only qualm I have about it is the video. The focusing system for the video isn't that great. It'll focus, then go out of focus, then focus again; over and over and over. I would definitely recommend a Nikon or Canon for sure. - this one is smaller with 2.1 x 3.4 x 0.76" dimension vs. the SD700's 2.2 x 3.6 x 1.1" dimensions. The SD1000 is very square-y. The SD700 is rounded. - don't know if you're picky about viewfinders... most cameras have viewfinders, some don't. But if it's super dark and you can't see anything from the LCD display, you can use the viewfinder, if the camera is equipped with one (both the SD1000 and the SD700 have a viewfinder). It's nice to have the viewfinder in dark situations or where you can't use the LCD display or if the LCD display's light disrupts others. But I'd highly recommend checking out http://www.dpreview.com (for in-depth reviews and photo samples of cameras) and http://www.bhphotovideo.com for your shopping needs. http://www.adorama.com sometimes has good deals too. But it's always good to go to your nearest store and touch and play with one before you hit the "submit"/"buy now" button! Good luck let us know what you got! +1 vote for the Pentax Optio line. I have an Optio W10 and for a point-n-shoot it is just dandy, with the considerable benefit of being waterproof and dustproof (dust killed my previous camera). The W20 and W30 are basically incremental revisions to the W10 I think, with various minor improvements. Only a 3x optical zoom, but it's rare to find a small P&S that has more than that. It does a very good job at closeups. Also, it uses SD cards (cheap and easy to find) rather than funky proprietary cards like Olympus and Sony prefer. Canon Powershot A540, like ooohfishy mentioned. True it's slightly bulky (or marginally compact, if you prefer) - but it's 6MP and is now fairly cheap. Runs off 2xAA batteries and has an optical viewfinder in addition to the LCD screen. This model has a variety of manual and auto settings for shutter/aperture, and fires a SINGLE flash (when in manual mode) which can be used to trigger slave flashes. And for those really wet caves, you can get the WP-DC2 housing to protect it. Bought one about 8 months ago, and haven't noticed it smelling of fish yet. The only drawbacks to my Optio W20 is that I have had to get used to not having a plain old stick it up to your eye viewfinder. I was initially reluctant to get it because it uses a lithium ion battery and I have worked so hard to make sure that all of my outdoor gear uses the same AA rechargeable batteries. I got over this when I discovered that I have yet to have it run out of juice on me and I've never had to switch to my second battery during a day outdoors. Very occasionally the camera will automatically select too high of an ISO and produce a grainy photo, but this is rare and it almost always follows up with a good photo immediately afterwards. All in all, this camera is a HUGE improvement over my last camera. 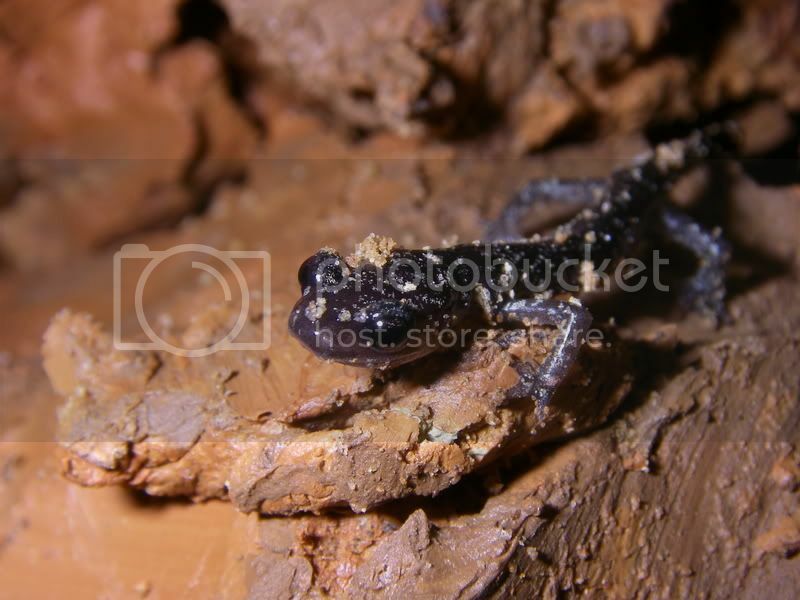 Here are some macro shots of a tiny cave salamander (less than 2 inches long) which were taken in the basic automatic mode. I can't imagine a P&S camera being much better for caving, especially because the water/dust proof design makes sure that I am never afraid to pull it out for the photo no matter what the conditions are. Thin with a battery bulge. camera, batteries, charger, software, etc. from $132 on Amazon. Memory card not included. Both closeup and macro close up settings. 4 flash settings Auto, forced, redeye and off. Nice, large LCD screen on back. I've had this since Christmas. Am pleased with the camera for its class. Excellent P&S for general use. I'm selling the photos off this camera. It has a slight bit of a problem with stop action, unless you are on the Sports setting. Decent in caves, but you need auxilary flash (problem with most P&S cameras). Does much better in low light if you use one of the low light scene modes (which actually are speed/aperture settings, though you cannot set them independently. Does not have a viewfinder--it's not big enough. 3.25 x 2.5 x .75 to 1 inch thick at batteries, which is also the 'graspable' side. Is it a Nikon or Canon? No. But hey, for the price... $150 camera, batteries, charger and card. You can splurge and get a perfectly fitting camera case at Walgreens for $7 like I did.